17 May 2018–The shape of the continental shelf off the southern Mexican coast played a role in the formation of long-lasting tsunami edge waves that appeared after last September’s magnitude 8.2 earthquake, according to researchers speaking at the SSA 2018 Annual Meeting. Edge waves are coastal waves generated by a larger tsunami wave. They travel back and forth parallel to a shoreline. 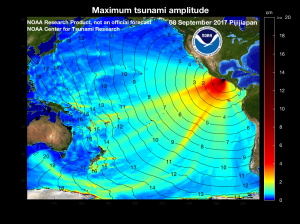 They can be an important part of overall tsunami hazard, depending on how big the edge waves are and how long they last, said University of Oregon researcher Diego Melgar. During the September Tehuantepec earthquake, said Melgar, high amplitude edge waves lasted for an unusually long time, around 48 hours. To understand this phenomenon, Melgar and his colleagues modeled the tsunami’s effects in relation to the shape of the region’s continental shelf, which had been mapped out previously using satellite data and sonar soundings from ships. Their models show that because the shelf is longer and flatter than other continental shelves worldwide, the shape of the shelf efficiently “trapped” the edge waves along the Mexican coast. Melgar said it’s possible that similar edge wave trapping could be a tsunami hazard in other places around the world where there are large flat continental shelves, such as the U.S. Pacific Northwest, Alaska near Anchorage, and northern Japan. “We need to make a systematic survey to see whether the edge waves can be trapped efficiently in other places,” he noted.